This is a pic that I did up as a request for that really just went way and beyond what it had started out as. I hope that you like it! Those strings on Kagome, are they from Yura? could be any diabolical villain! I just thought they were hair strands. omg i love it!!!!!!!!!!!!!! i love anime ballet!!! I love this!! Great work with the costuming! The red eyes are a really nice little detail! This is amazing! What a cool idea! Not just the ballet, but the strings and Kagome's possession-look! Wicked cool! Plus, your drawing style is superb. wow! what gracious comments! Thank you! Your welcome. I really like it! Aw! Thanks! I was really worried when the guy who prompted the pic wanted ballet...I didn't think I could pull anything off with that that would be cool enough to fit the Inuyasha storyline but then this...just kinda hit me! *laughs* I was very pleased to with how it turned out! I am very glad that you like it! He looks pretty good in tights. lol Nice job. lol I bet, I probably would too. This is so amazing.. I love the concept. *laughs* Mmmmmm, man thighs! *laughs* Thanks for the great comments! I really appreciate it when people take the time to comment! Dude, when guys are in ballet or wear these skin-tight clothing, you can't HELP but notice their toned man-thighs. It's ridiculous. And that's why I commented on his ;D Bwahaha! No problem!! It's a really awesome picture. I love their expressions... I think expression is one of the most important features of a picture for me. He's like, ? LOL. But I would be that, too, if I had realized the person I was dancing with was possessed or some sort. *lol* I love your take in things! Icould totally see inuyasha being like WTF?! 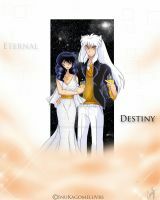 You have really nice art work of Inuyasha. I liked the sensation this one gave off. Thank you so much ! I am glad that you like it! You compliments are wonderful! Oh, and don't worry there is more to come! Your welcome! That's great to hear. I will look foward to it. ...But seriously, Inuyasha's been on stage with Kagome before, I'd bet he'd do it agen if she asked him, this could totally happen.